The term “bandwagon fan” is one that carries a negative connotation. The bandwagon fan only starts to support a team when that team is having some level of success. If the team is a historically bad team or is a team that is experiencing tough times, the bandwagon fan is nowhere to be found. To be labeled a bandwagon fan is often meant as an insult. The “true fans” have a sort of animosity towards the bandwagon fans because, well, they’re bandwagon fans. I grew up a fan of two teams: the Milwaukee Brewers and the Boston Red Sox. I was a fan of the Brewers because I grew up in Wisconsin and was lucky enough to attend a game or two every year at County Stadium. I was a Red Sox fan because I actually got to see them play of television occasionally. I also wanted to be a pitcher when I was young, and Roger Clemens became my favorite pitcher for quite some time. When he bolted to Toronto, I stayed with Boston. To this day, I cheer for Milwaukee and Boston. It’s what I’ve always done, and while I may be more of a die-hard for Milwaukee as I attend more and more games each year, I assume I’ll always root for both teams. Boston and Milwaukee. I’m not sure if there could be two more opposite markets outside of New York than those two. Red Sox Nation spreads far across the globe, with many lifers and bandwagon fans sporting Boston gear on a daily basis. Even when Boston struggles from time to time, they still sell out every game and do very well when it comes to merchandise sales. Frankly, Boston is such a large market naturally that the bandwagon fan does not make much of an impact to the day-to-day and season-to-season operations of the Red Sox front office. The Brewers need the bandwagon fans. 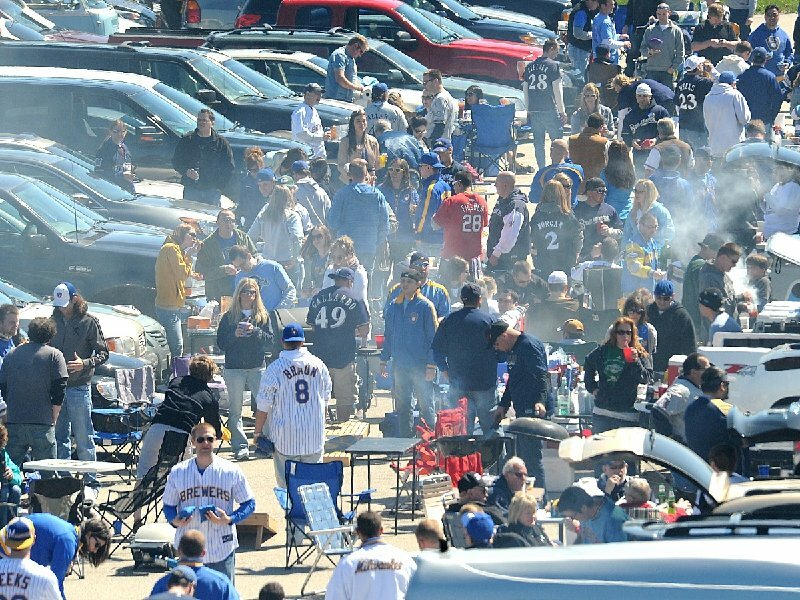 Without bandwagon fans, Miller Park might start looking like it did back in 2003. It’s no secret that Milwaukee is the smallest of the small-market teams in Major League Baseball. From 2002-2006, the Brewers ranked no higher than 17th in total attendance in any of those seasons. In 2007, when Milwaukee finished above .500 for the first time since the ’92 season, Milwaukee’s attendance jumped to 12th in all of baseball. After that, the Crew finished 9th (2008), 9th (2009), 11th (2010), and 7th (2011). In 2012, the Brewers are currently sitting in 11th place once again. It should be no surprise that as the Brewers started to find more success on the field, they also found more success at the ticket office. That’s how this whole system works. If the team is winning, the bandwagon fans will find their way to the ballpark. And when the team starts to struggle, the bandwagon fans will scatter. Without the bandwagon fans, the front office might not spend the way they have in recent years. 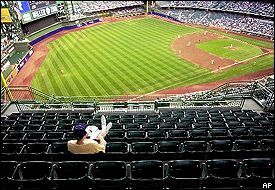 But as those attendance numbers so clearly point out, those bandwagon fans are immensely important when it comes to stimulating the Milwaukee Brewers economy. And when the Brewers are selling more tickets, more jerseys, more concessions, more everything, the front office is going to be more inclined to spend some of that money they are making. When those attendance numbers drop, so will the payroll of the Milwaukee Brewers. Here’s my point: the self-proclaimed “true fans” of the Milwaukee Brewers should not be so quick to vilify the bandwagoners when they jump ship because, unlike Boston, we need them. The cold, hard truth is that the next few years could be very lean ones in Miller Park. Zack Greinke could (and should) be traded in the next few weeks. Shaun Marcum’s recent trip to the DL should be seen as a blessing to Doug Melvin, because Marcum was quickly pitching himself out of Milwaukee’s comfort zone as far as his next contract is concerned. Rickie Weeks hasn’t been Rickie Weeks ever since he legged out an infield single last July against the Cubs, spraining his ankle in the process. The farm system has some decent pieces, but there’s not a lot that’s ready to be harvested for a while yet. Outside of Ryan Braun, Yovani Gallardo, and The Jonathon Lucroy, Milwaukee doesn’t have a lot of long-term promise on the current roster. And if the bandwagon fans don’t find their way to Miller Park every now and then, things might not get much better any time soon. So, to the bandwagon fans out there, I would just like to remind you about the fun times we’ve had these last few years. Remember the Sabathia craze? Prince’s monster shots? Braun’s MVP? T-Plush and Beast Mode? The NLCS? The tailgating? Even though times are rough right now, that can’t erase all of those memories, can it? And to the “true fans” out there, I just want to remind you to invite those bandwagon fans out when you go to catch the game at a local sports bar. And when you are planning a weekend trip to Miller Park, remember to include those same bandwagon fans in your evite or your Facebook event. Above all else, do whatever you can to keep those bandwagon fans from straying too far. Bandwagon fans, don’t be strangers to Miller Park. On behalf of Brew Crew Nation, this die-hard member wants to let you know that you are always welcome here. This entry was posted in News and tagged Bandwagon Fan, Boston Red Sox, cc sabathia, County Stadium, Doug Melvin, Jonathan Lucroy, mark attanasio, Miller Park, Milwaukee, Milwaukee Brewers, Milwaukee Brewers 2012, Prince Fielder, Rickie Weeks, Roger Clemens, Ryan Braun, Shaun Marcum, Yovani Gallardo, Zack Greinke. Bookmark the permalink. Great point Ryan! Nice article…but my question is…if the “bandwagon fans” never fall off the wagon and continue to support the Brewers…are they still “bandwagon fans?” BOOM! Mind Blown!! I don’t know if the Brewers’ fans will fall off the map that quickly. I can’t speak for this year, but last year I went to Miller Park and that place had the best energy I have ever experienced at a ballpark, and I have gone to my fair share of Yankee games. Logic would tell you the place should get empty quickly after they stop being relevant baseball-wise, but I don’t know if that kind of magic fades away quickly.